The four-star Hotel Aquarell provides 92 rooms and apartments in a 3-storey building that can accommodate up to 178 guests at the same time. All the rooms are nonsmoking in our hotel. If you would like to unwind and relax, the Harmony Wellness Center of our hotel is happy to welcome you among its guests. In the infra sauna at a maximum of 40 degrees Celsius the infra rays penetrate the upper layers of the skin where they loosen up the waste and toxic materials so they can leave the body through perspiration. 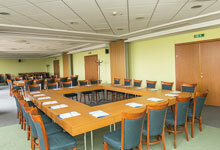 No matter if you look for indoor programs making use of the hotel’s amenities e.g. : meeting rooms or the wellness facilities; or outdoor programs for which the immediate surroundings of the hotel make it a perfect choice, you will find everything according to your needs. Superior Suites When an occasion calls for something extra special, our superior suites are a perfect choice. 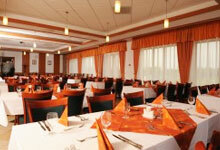 A’la Carte Dining Our restaurant is open to hotel guests and day visitors alike. We offer a ’surprise and delight’ factor. Conference and training Make the moments of active relaxation unforgettable for your coworkers. Address: Cegléd, Fürdő út 24. 2013 © Service 4 You Operation Kft.